The votes are in, the results have been tallied, and the Art Everywhere US works have been chosen! The voting was so close that fifty-eight works of art made the cut (including ten works from the DMA) and will be reproduced on billboards, bus shelters, subway platforms, and more this August. Be on the lookout for The Icebergs or Dorothy on your commute and stop by the DMA to visit the works in person. John Singer Sargent, Dorothy, 1900, oil on canvas, Dallas Museum of Art, gift of the Leland Fikes Foundation, Inc. Tomorrow is Titanic Remembrance Day, an annual observance of the lives lost when the unsinkable ship sank on April 15, 1912. Frederic Edwin Church’s The Icebergs, in the DMA’s collection and on view on Level 4, provided an opportunity for Museum staff to reenact a film still that captured the ship’s story. Kimberly Daniell is the manager of communications and public affairs, Madeleine Fitzgerald is the audience relations coordinator for programming, and Adam Gingrich is the digital media specialist at the DMA. Be a guest curator for the largest art exhibition in America! Beginning today, you can vote for your favorite American artworks from art museums across the country, including the DMA. Art Everywhere US is a public celebration of great American art. The process to create this celebration began this past New Year’s Eve, when I e-mailed the directors of four leading U.S. museums—the Art Institute of Chicago, the Los Angeles County Museum of Art, the National Gallery of Art, and the Whitney Museum of American Art—asking if they would jump in feet first with the DMA and the Outdoor Advertising Association of America to create a 100-work synopsis of American art history. I was thrilled when everyone agreed right away, and by January 2014 we were off to the races. I asked each museum to submit 30 works, yielding 150, and I had the unenviable task of winnowing the list down to 20 each to reach 100. We were seeking a balanced result, representing every period of American art from across the nation, with attention to ethnic and gender diversity, and the inclusion of iconic works alongside whimsical ones. We stuck to two-dimensional works given their planned reproduction on out-of-home media. It is now up to you to help decide which of these 100 works will be part of the first Art Everywhere US project. From now through May 7, you can vote for your favorite 10 works daily to help inform the final 50 works. The final works will be reproduced this August on as many as 50,000 outdoor displays from coast to coast. Make sure you get to see your favorite work of art on a billboard during your commute this summer, whether it’s the DMA’s The Icebergs, the Art Institute of Chicago’s American Gothic, the Los Angeles County Museum of Art’s Campbell’s Soup Can, the Whitney’s Little Big Painting, or the National Gallery’s George Washington. We aren’t trying to stack the deck in the DMA’s favor, but instead are enjoying the playful spirit of this massive endeavor. Vote early and vote often! And please share your votes with #ArtEverywhereUS and connect online. Maxwell L. Anderson is the Eugene McDermott Director of the DMA. Did you know January 14 is national Dress Up Your Pet Day? Yeah, we didn’t either. Here at the DMA, we not only love our art, but we also love our animals. 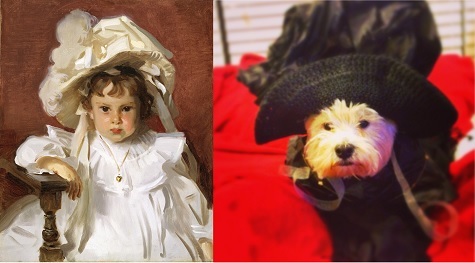 We couldn’t resist combining some of our favorite works from our permanent collection with some of our favorite pet pals. We promise that no animals were harmed in creating these photos. Well, maybe just a few pet egos. I wanted to transport Hogue’s characteristic desert-like scene to my tiny apartment, and lucky for me, I was able to find an eager canine ready to put on a cow costume and thirstily explore a bathtub water tank. This work will soon be on view in the upcoming exhibition Alexandre Hogue: The Erosion Series. 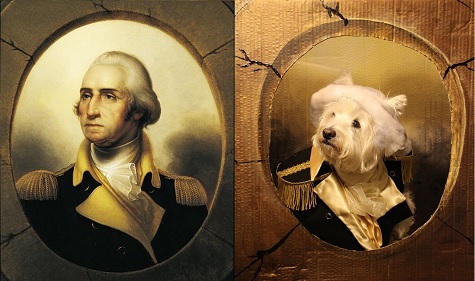 Like George Washington, George the Westie is courageous and fearless in the face of danger. He is an alpha dog and has been known to keep much larger dogs in line. Plus, I thought that he would look very handsome in a colonial costume. Artemisia and Shelby love the outdoors; in particular Artie likes to sunbathe and Shelby loves to people watch while enjoying a nice breeze. They like Bernard’s painting because it looks like a place they would like to visit: a lush field, rich with bright hues, and filled with nice ladies who might pet them. I’ve admired Ben Nicholson’s White Relief long before I was even an employee here at the DMA. I respond to minimal and reductive aesthetic strategies and this one is a stellar example of such. When I found Ajax asleep in my chair, viewed from that overhead perspective, my mind went immediately to the work by Nicholson. Quick iPhone shot and some simple Photoshopping and there it is. Tortoises look like monumental rock formations anyway, so The Icebergs seemed like a perfect fit. It was honestly more entertaining having them roam around the yard with their ice hats on running into things. Dorothy is one of my favorite works in the collection. Chloe is sassy and has an attitude and I envision Dorothy was the same way. A white ensemble did not show up well on her fur, so she went for a more brooding Dorothy look. A dear friend of mine once called Mosey “a little dumpling,” and even though she is really all muscle, the nickname stuck. 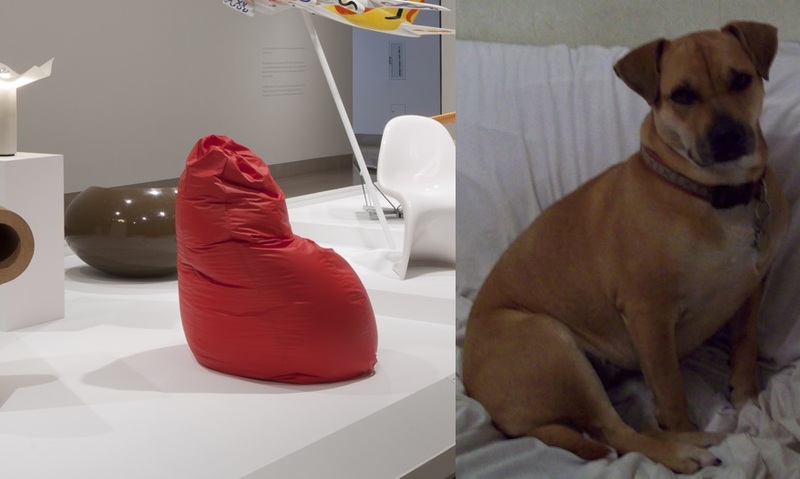 She always sits sideways, directly on her rear end, and her “dumpling” shape reminds me of the red beanbag chair currently on view in the exhibition Form/Unformed: Design from 1960 to the Present. Pollock is one of my favorite painters, particularly in the way he suggests “energy made visible”. 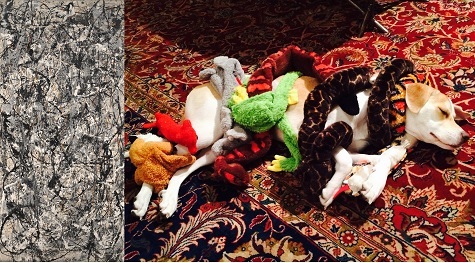 My dog Jane is the definition of visible energy, and her life often looks like a Pollock painting. She ate the string I bought to design our interpretation of Cathedral, so we improvised with some of her toys. I think Pollock would approve. 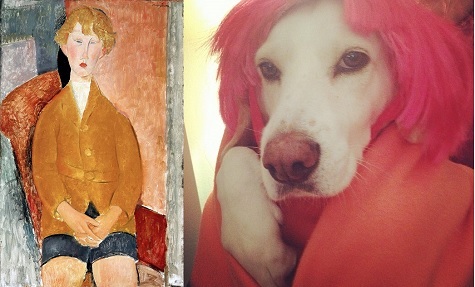 Ever since I adopted Sabby, I’ve seen the similarities in her proportions to that of a Modigliani work. She has a short, long stocky body with an abnormally long neck and a smallish head. When attempting a photo shoot, however, she was not in the mood to show off that long neck. So instead you’ll see her similarity to Boy in Short Pants through her piercing eyes and elongated face. You may also see that she wanted to add a twist of Warhol—which is where her true personality lies. 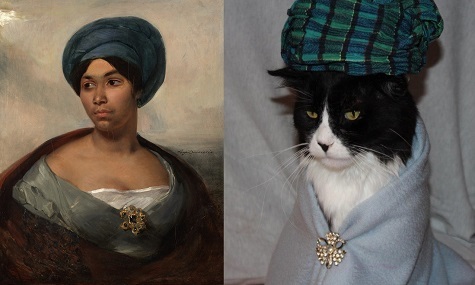 Visit the DMA’s collection galleries, included in free general admission, to find inspiration for your pet’s high fashion and share your photos #DMApets! Images: Alexandre Hogue, Drouth Stricken Area, 1934, oil on canvas, Dallas Museum of Art, Dallas Art Association Purchase, (c) Olivia Hogue Marino & Amalia Marino; Rembrandt Peale, George Washington, c. 1850, oil on canvas, Dallas Museum of Art, The Karl and Esther Hoblitzelle Collection, gift of the Hoblitzelle Foundation; Emile Bernard, Breton Women Attending a Pardon, 1892, oil on cardboard, Dallas Museum of Art, The Art Museum League Fund; Ben Nicholson, 1936 (white relief), 1936, oil on carved board, Dallas Museum of Art, Foundation for the Arts Collection, © 2011 Artists Rights Society (ARS), New York / DACS, London; Frederic Edwin Church, The Icebergs, 1861, oil on canvas, Dallas Museum of Art, gift of Norma and Lamar Hunt; John Singer Sargent, Dorothy, 1900, oil on canvas, Dallas Museum of Art, gift of the Leland Fikes Foundation, Inc.; Pair of mythical animals (asos), Malaysia, Sarawak, middle Rajang River region, Greater Sunda Islands, Kayan people, 19th century, wood, Dallas Museum of Art, The Roberta Coke Camp Fund and the Museum League Purchase Fund; Eugène Delacroix, Portrait of a Woman in a Blue Turban, c. 1827, oil on canvas, Dallas Museum of Art, The Eugene and Margaret McDermott Art Fund, Inc., in honor of Patricia McBride; Sacco, Piero Gatti, Cesare Paolini, and Franco Teodoro, designers; Zanotta, maker, designed 1968-1969, vinyl and polystyrene, Dallas Museum of Art, gift of Zanotta; Jackson Pollock, Cathedral, 1947, enamel and aluminum paint on canvas, Dallas Museum of Art, gift of Mr. and Mrs. Bernard J. Reis, © Pollock-Krasner Foundation / Artists Rights Society (ARS), New York; Edward Hicks, The Peaceable Kingdom, c. 1846-1847, oil on canvas, Dallas Museum of Art, The Art Museum League Fund; Amedeo Modigliani, Boy in Short Pants, c. 1918, oil on canvas, Dallas Museum of Art, gift of the Leland Fikes Foundation, Inc.
Catherine Cody is special events and volunteer relations manager and Kimberly Daniell is the communications and public affairs manager at the DMA. This week we celebrate a homecoming at the DMA. Frederic Church’s The Icebergs is now back on view after almost a year on tour with the exhibition The Civil War and American Art. 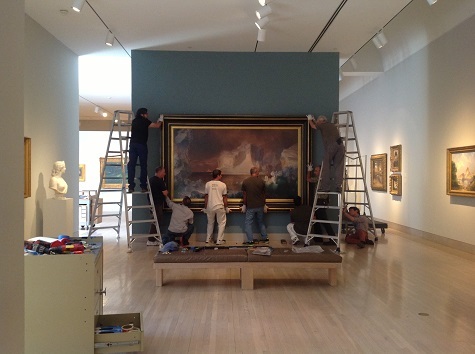 Watch the painting’s journey from its travel crate back to the DMA’s American Art Galleries in the video below, and join us for our free lunchtime Gallery Talk at 12:15 p.m. on Wednesday, September 18, with DMA curator Sue Canterbury to welcome home The Icebergs! Kimberly Daniell is the PR manager at the DMA. Considered by some to be the DMA’s Mona Lisa, Frederic Edwin Church’s The Icebergs has been a destination icon for museum visitors ever since it was placed on display in 1979. Measuring slightly over 7 feet high and 11 feet wide in its frame, and weighing a cumbersome 425 pounds, it is the anchor of the American galleries in both a figurative and literal sense. 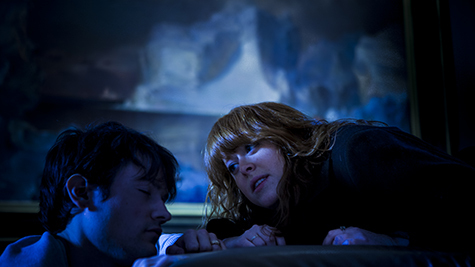 Consequently, its presence is as keenly felt as its absence. Yet, there are times when a museum must make a sacrifice—albeit reluctantly–in the support of new art historical scholarship. 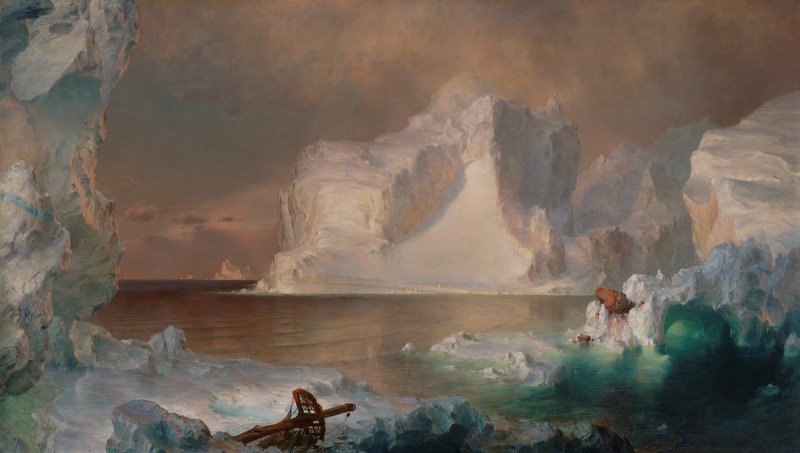 The Icebergs is to play a pivotal role in the presentation of the upcoming exhibition The Civil War and American Art, which will open at the Smuithsonian American Art Museum and travel to the Metropolitan Museum of Art in New York. Longtime members of the DMA will be pleased to know that this important exhibition has been organized by the DMA’s former curator of American Art Dr. Eleanor Jones Harvey, who has been with the Smithsonian American Art Museum since 2003. The exhibition will feature key works by America’s greatest artists of the era. These works channeled the conflicting emotions of a nation coming to grips with a reality that altered the very fabric of its identity and transformed its once unassailable optimism into dread for the unknown outcomes that lay ahead. Key to charting the path from America’s loss of faith to its eventual hope of redemption will be four monumental landscapes by Frederic Church: The Icebergs, Cotopaxi, Aurora Borealis, and Rainy Season in the Tropics. The first two works have often been paired in a binary context of arctic and tropics, but, in this presentation, their multiple layers of meaning are to be revealed. In the case of The Icebergs, Church changed its title to The North for its debut just twelve days after the beginning of the war in 1861. He also donated all the ticket proceeds to the Union Red Cross. 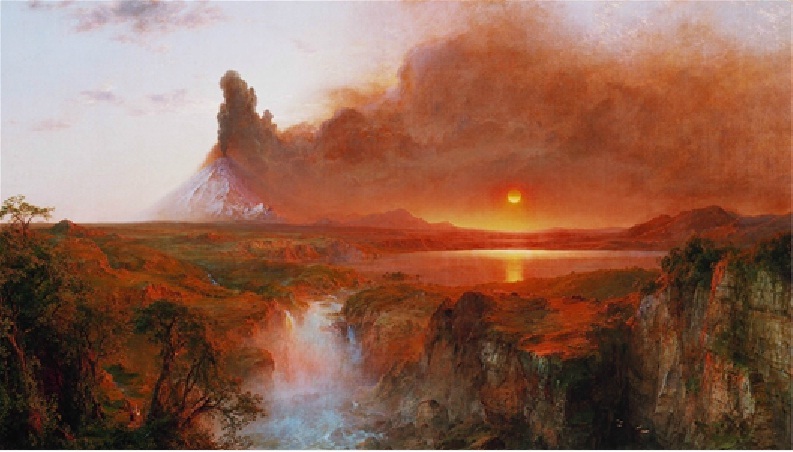 In his painting of the following year, Cotopaxi, Church depicted paradise rent asunder by the volcanic and explosive forces of nature as a symbolic reflection of the cleaving of a nation. 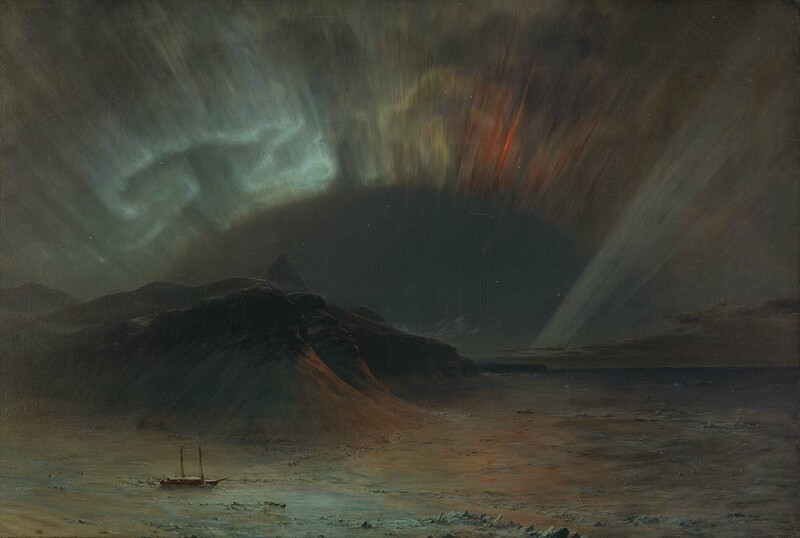 A month before the end of the war, Church exhibited Aurora Borealis, wherein the darkness of the endless arctic winter echoed the weariness that dominated the American psyche. 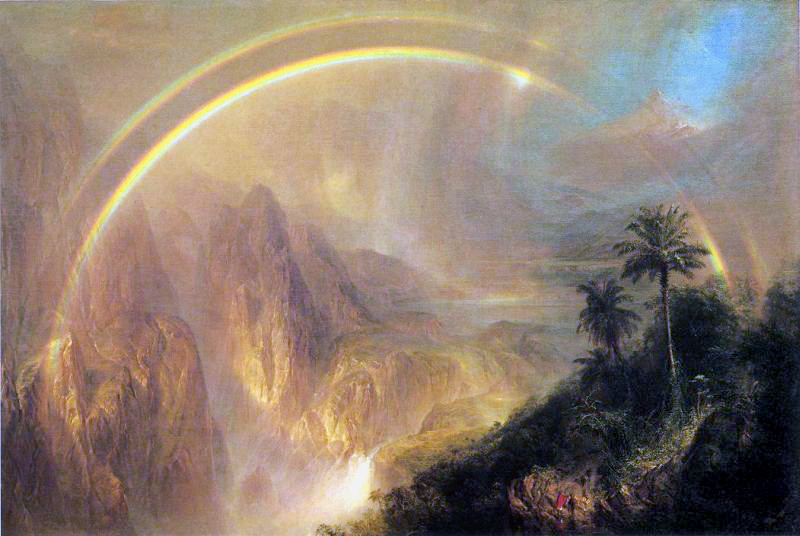 In Rainy Season in the Tropics, presented in 1866 after the close of the war, Church delivered the viewer—and a nation—from its trials and tribulations into a paradise redeemed by a nourishing rain and the promise of a double rainbow. For those wanting to bid a fond farewell to The Icebergs before its departure, please be sure to do so before mid-October, when it will be removed from view. If you would like to see the DMA’s masterpiece in the context of the exhibition, it will be at the Smithsonian American Art Museum in Washington, D.C., November 16, 2012–April 27, 2013, and then in New York at the Metropolitan Museum of Art May 21–September 2, 2013. Sue Canterbury is The Pauline Gill Sullivan Associate Curator of American Art at the Dallas Museum of Art. Wishing for a wintery holiday season filled with snowflakes and snowmen? Even though a snow-white holiday may be wishful thinking here in Dallas, you can still get in the holiday spirit at the Museum. Bring the whole family to enjoy the many winterscapes we have displayed in the galleries, and create your own holiday-inspired work in the Center for Creative Connections!